I may not be a Rachel Ray, but there's one thing in my kitchen for which I am renowned: I make a superb cup of coffee. Besides the basics -- filtered water and freshly ground dark-roasted beans -- I do have one secret, which I'm going to share with you. My french-press. More specifically, my Bodum thermal french-press. It's not just that the coffee tastes good. What I enjoy so much about my morning coffee is the whole ritual of preparing, pressing, pouring and sipping the coffee. 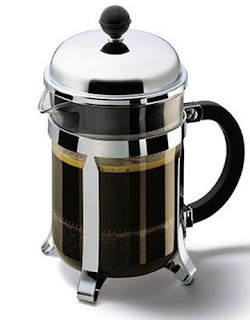 And what makes this model different from other french presses is that the coffee stays hot for hours. On the left is a traditional french press, $33 on Amazon. On the right is a thermal french press, $60 on Amazon. We bought our thermal press 8 years ago after our glass press broke. So even though it's more expensive initially than the traditional version, the thermal press much more durable and more economical in the long run. The product description says the press holds 8 cups, but don't count on satisfying 8 breakfast guests with one pot of coffee. 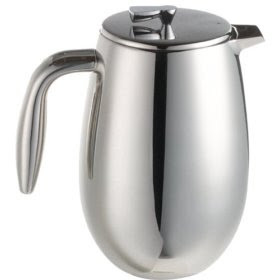 The thermal will fill three large mugs or possibly five smaller cups. Coffee that's never passed through a filter tastes noticeably different to me. And another bonus? The thermal press is dishwasher safe. I've been giving my Bodum Thermal Coffee Press a double thumbs up privately for 8 years. Finally, I'm taking my thumbs public on this matter. I have one of these. It totally rocks! I've had your wonderful coffee and it is DElicious!! We still have the frame to our press but had a hard time finding a new "glass" for it. It broke 10 years ago. Hm. I'll have to check this out.